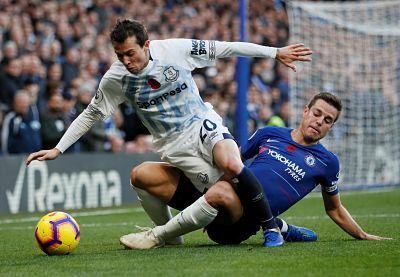 Goals from forward Richarlison and midfielder Gylfi Sigurdsson helped Everton beat Chelsea 2-0 in the Premier League on Sunday, denting the London side's hopes of finishing in the top four. Brazil's Richarlison headed Marco Silva's side in front from close range in the 49th minute after Kepa Arrizabalaga had kept out striker Dominic Calvert-Lewin's powerful header from Sigurdsson's corner. Everton went 2-0 up in the 72nd minute when Sigurdsson put the ball past Arrizabalaga from the rebound after his penalty kick was saved by the Chelsea goalkeeper following a foul in the box on Richarlison by Marcos Alonso. Everton came out in the second half a transformed side and went close two minutes after the break, when midfielder Andre Gomes forced a save with a stinging shot from distance. They then took full control of the contest. Chelsea had been unlucky not to score after a good start. Eden Hazard's drive was saved by Jordan Pickford in the sixth minute, before he hit the post a minute later and Argentina striker Gonzalo Higuain had a shot cleared off the line. 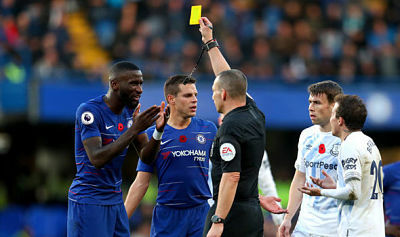 The result meant that Everton climbed to 11th with 40 points from 31 matches while defeat meant that sixth-placed Chelsea stayed on 57 points from 30 games, a point behind Manchester United above them and three points behind fourth-placed Arsenal. Coach Maurizio Sarri was at a loss to explain his side's collapse. "I don't know and the players don't know what happened in the second half," the Italian said. "I cannot explain it. We played the best first half in the season and we could have scored four or five and then suddenly we stopped playing. It's strange and we stopped to defend and counter-attack. He further added that, "The problem was mental on the pitch, so the system and the tactics are not important. It wasn't about motivation because we started very well. We have to play eight matches now and we have to fight for our possibilities."